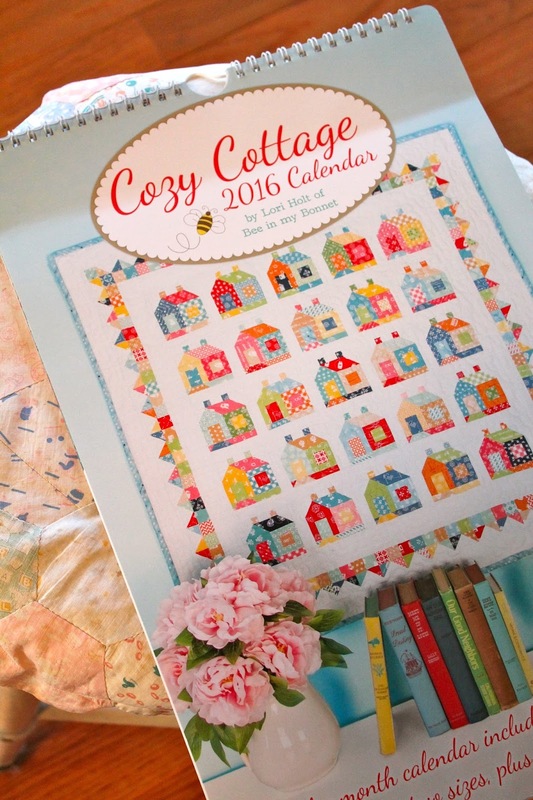 Sewn With Grace: Cozy Cottage Calendar Celebration! Today I'm excited to be part of a group of bloggers, celebrating Lori Holt of Bee in my Bonnet, new limited edition calendar. 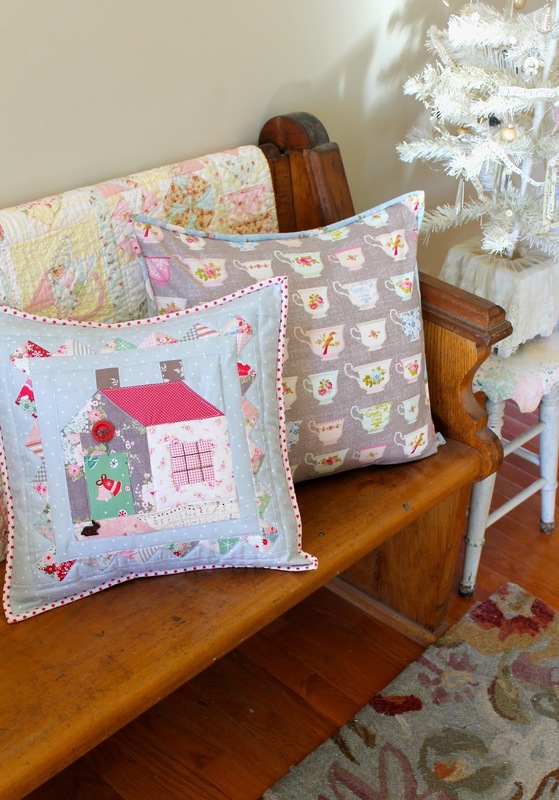 This twelve month calendar features beautiful photos of Lori's gorgeous home and includes her pattern for a house block in two sizes, plus a mini quilt and pillow. I used the eight inch block to make her Cozy Cottage pillow. Christmas has been on my mind so I decided to pull out some of my favorite Tilda fabrics for a Christmas Cottage pillow. 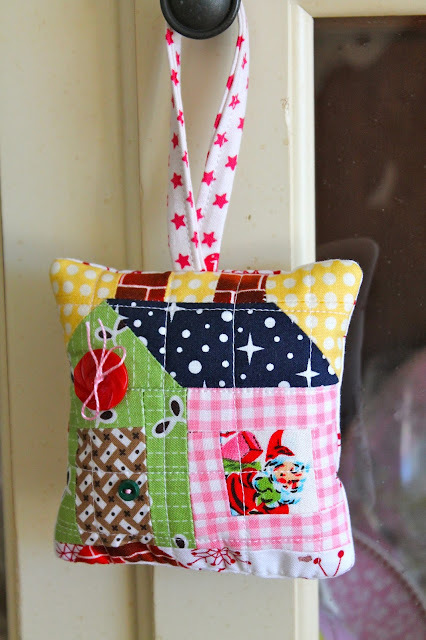 I couldn't stop there, I made the super cute four inch block into an ornament with Santa peering out the window! 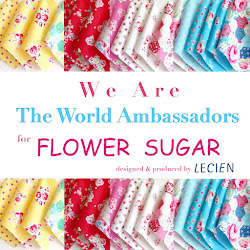 As ever, Lori's instructions are clear and easy and make the whole process of creating so fun! The Fatquarter Shop is hosting the celebration, go here for a list of participating bloggers and for a look at their fabulous creations. While you're there, don't forget to purchase the calendar before they're sold out. This would make a great present for the quilter in your life! Your pillow is adorable. I have wanted to sew some Christmas so bad lately. Hope you are having a wonderful a week. 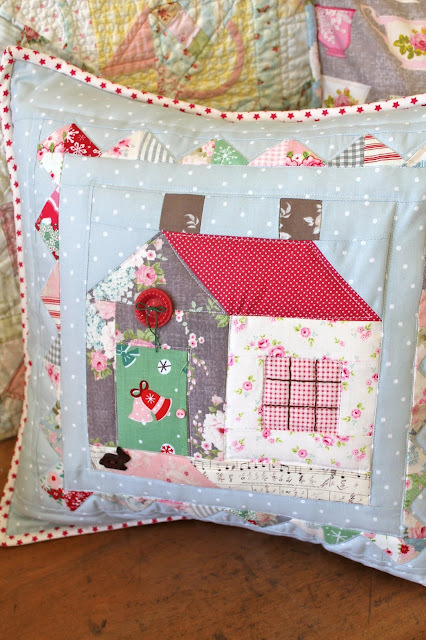 Just love your Christmas Pillow with the little button wreath. I see bunny is ready to maybe cozy up to the fire :)! What a wonderful idea with the door ornament - hmmmmmm! 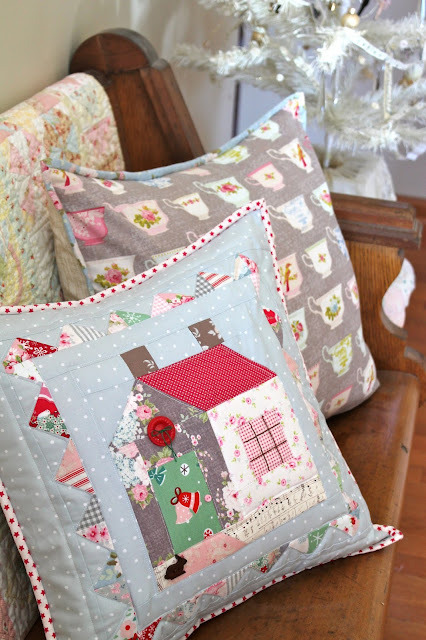 I ALWAYS love house blocks...your pillow is adorable. The fabrics are just wonderful and inspiring. oh this is so adorable!! I want to make a Christmas one now, too!!! This is inspiring!! i will be right here staring at your adorable pillow if you need me. I LOVE IT! I just love your sweet pillows on your bench! So adorable... and then I saw your little door hanger! Eek! Cuteness!!! I ordered my calendar today! I saw your post and it inspired me to make some of those cute cottage blocks! Love your blog!